I rather ignorantly hadn’t realised until recently that part of my Mum’s job as a district nurse was performing the last offices procedure, meaning washing and dressing patients who had passed away at home. I was taken aback but, although I can’t articulate it here with the eloquence mum did, she explained to me that preparing someone in keeping with their final wishes is the last act of kindness, care and respect you can show a person and is therefore quite a special thing. This idea floated through my mind as I queued with thousands of others to see the preserved body of Vietnam’s most celebrated president and founding father, Ho Chi Minh. It was his final wish to be cremated and his ashes scattered across his beloved country, from south to north. Instead, the government ignored his wishes and built an obtrusive mausoleum where his frail, lifeless form would forever lay waiting to be gawped at by millions of locals and tourists. The regulations spoken oven the tannoy, printed on signs and enforced by at least a hundred strict security personnel are not to chew gum or smoke in the grounds and to dress modestly with long sleeved tops and knee length skirts or trousers for the occasion. You’re reminded that when entering the mausoleum you must keep your hands out of your pockets, you mustn’t smile and you mustn’t make any sudden movements. All of this in order to show respect. As I fixed my face to its most severe expression I wondered what the point of all these formalities were when Ho Chi Minh has surely already endured the biggest act of disrespect possible having had his final wish disregarded so fiercely. 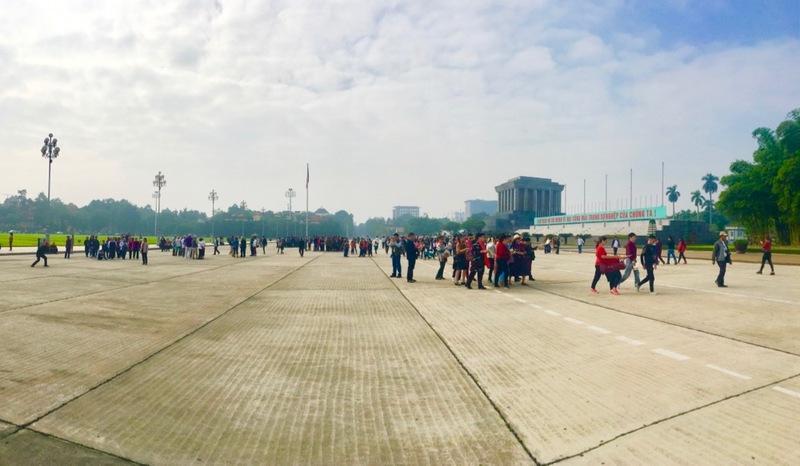 I found the lines of hot dog selling vendors and shops selling ‘I love Vietnam’ t-shirt’s that we were herded through afterwards less than respectable. It was as if I’d been transported to the gift shop of a zoo. People gather for group photographs outside the mausoleum. The whole experience felt so juxtaposed with that it was supposed to be celebrating. After visiting his body in the mausoleum we once again lined up to view Ho Chi Minh’s stilt house, a simplistic structure where he had preferred to reside over the grand presidential house. Over eager middle aged women elbowed their way to front to get a better look at the minimalistic study and bedroom while families held up the impatient queue by stopping for selfies. All this chaos hardly felt like a representation of his famously favoured simplistic lifestyle and apparently humble personality. I found the whole experience macabre and depressing. Not because the main attraction is looking at a corpse, it could have well been a realistic wax work figure laying there illuminated as we all trudged around silently. It was depressing because it’s so far detached from what he wanted. Perhaps because I’m not Vietnamese the experience lacked a certain poignancy but still; I can’t imagine Ho Chi Minh looking down on this charade with much dignity and pride left in his heart. I took solace in constructing my own conspiracy theory; that his family did in fact cremate him and scatter his ashes amongst the cascading rice terraces, across turquoise beaches and down the lush mountainsides of his Vietnam. In spaces where children can laugh and play freely without being scolded, where community and culture is rife and where the country’s serene beauty comes to life. As I drifted into my day dream I imagined his family paying millions of Dong to commission the most lifelike waxwork figure of his body. The fact that the mausoleum is closed for two months annually so that his body can be flown to Russia for preservation is a rumour they started in order to abate conspiracies like my own. Just then, a boy of about six years old strutted by sounding a rubber chicken bought in one of the gift shops, bringing me right back to reality. 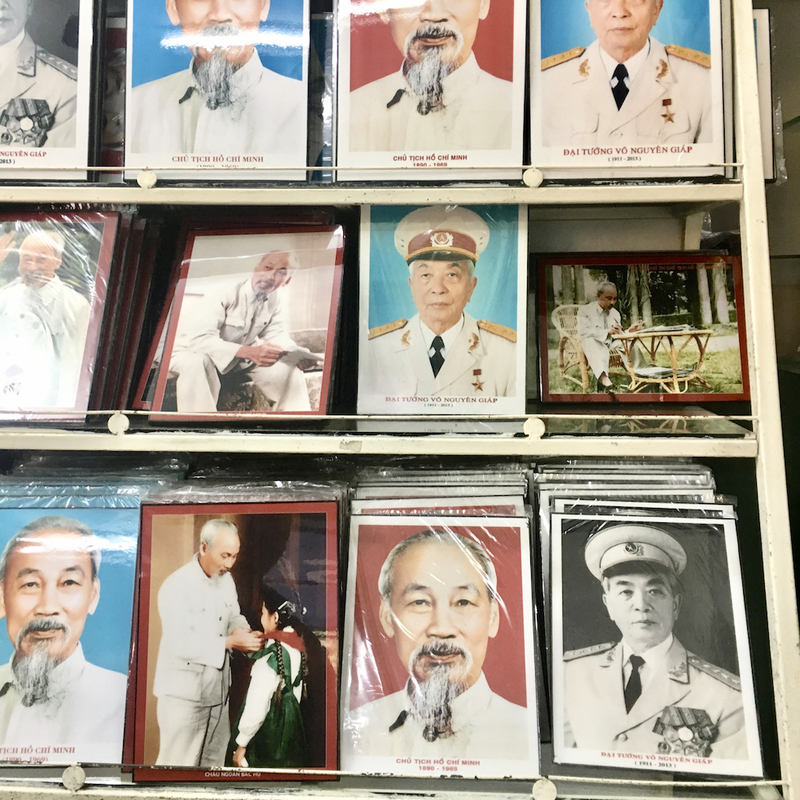 Possibly every photograph ever taken of Ho Chi Minh is available for purchase so you can create your own shrine at home.